Almost unnoticed, in the gaps and hollows of the digital economy, a new economy is emerging that follows a different ethical and financial logic. Platform cooperativism, as it has come to be called, is an emerging movement for democratic governance and collective ownership on the Internet and a fairer future of work. It is a concrete, near future alternative to the on-demand economy; it reclaims humane principles like mutuality, sympathy, and solidarity by bringing together the rich heritage of cooperativism with 21st-century technologies. The pieces are coming into place. Freelancers are forming cooperatives to find clients and pool insurance through platforms of their own. Uber drivers are leaving the mothership, organizing in co-ops, and designing their own taxi apps. Photographers are offering their work for fair prices on a platform where they’re in charge, and journalists are crowdfunding news portals co-owned with their audiences. New decentralized networks are enabling people to share their data with each other without relying on a corporate cloud. Contrary to the rules of the dominant algorithmic gatekeepers, platform cooperativism puts the online economic infrastructure into the hands of the people who depend on it most. The cooperative platform economy can become one of the counterforces to the defects of the on-demand economy. It is a strategy for reversing wealth inequality, gender inequity, environmental degradation, and systemic racial injustice. The experiments now already underway show that a global ecosystem of cooperatives can stand against the concentration of wealth and the insecurity of workers that yields Silicon Valley’s winner-takes-all economy. They show that the Internet can be owned and governed differently. Since the “Platform Cooperativism: The Internet, Ownership, Democracy” event in November 2015 at The New School, conferences and community meetings about the cooperative platform economy have taken place in Berlin, New York City, Florence, Bologna, Weimar, Melbourne, London, Brussels, Boston, Budapest, and Philadelphia. A new book, Ours to Hack and to Own, gathers many of the rationales and experiments that are driving the movement forward. The Platform Cooperativism Consortium will launch at this event, creating a global network of institutions to support this eco system of businesses. The vision is spreading. A year later, we need to keep the momentum building and continue forging the critical connections necessary to make this vision even more a reality. 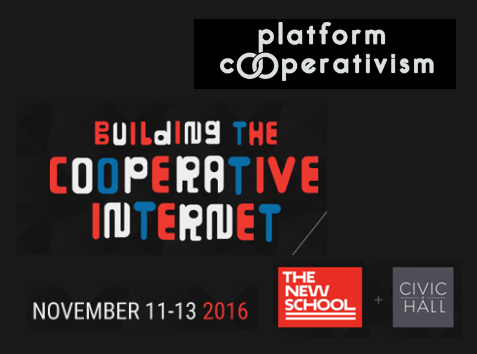 On November 11-13, 2016, “Platform Cooperativism: Building The Cooperative Internet” will take place at The New School and Civic Hall in New York City. On Day 1, we will bring together an international group of policymakers to discuss regulation and investment in alternative models. In the afternoon, we’ll think through the legal and design implications of the cooperative platform economy. On Day 2, discussions will focus on global opportunities for convergence among worker resistance, unions, and cooperatives. How can online co-ops meet some of the platform economy’s challenges that the labor movement has struggled with? On Sunday, Day 3 an unconference co-sponsored and hosted by our partner Civic Hall will allow for an open stream of project proposals for the platform co-op space. Building the basis for a popular movement in support of a fairer cooperative digital economy requires countless people, projects, inventive organizations, publications, and events around the world. “Platform Cooperativism: Building The Cooperative Internet” will be part of this effort. Join us online and in person. She earned her BA at UC Santa Cruz in Politics and Global Information and Social Enterprise Studies. At UCSC she was a Fellow and Coordinator for the Everett Program, which trains undergraduate students to become enterprising tech-literate activists for local to global social justice causes. In 2008, Maira lived and worked in Kuala Lumpur, Malaysia, as a legal researcher and tech intern with Sisters in Islam, a Muslim feminist organization. Next: Alternative Banken – Was macht die GLS Bank besser?